Thursday, June 9, 2011 :: IT IS OUR FIRST BIRTHDAY! 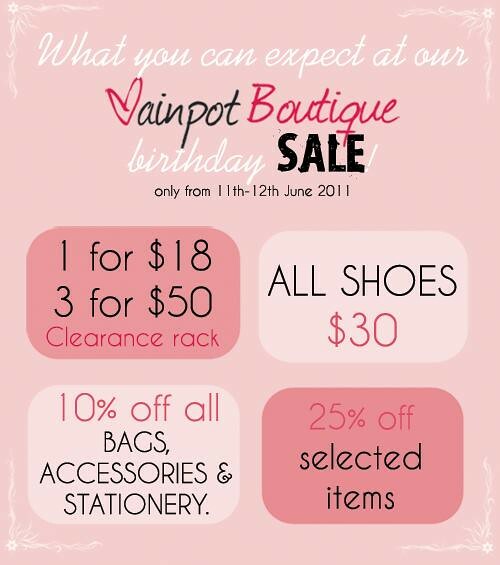 with a huge sale event this coming Saturday, 11 June 2011 from 12pm onwards! We've specially sewn and handmade drawstring fabric make-up pouches which will contain a SGD10 voucher (while stocks last!) you may use at our boutique. More information inside the email! So check it out! And this is not the end of it! To all mailing and non-mailing customers, here's what you can expect on that day! We are not holding back on our sale prices so we promise it will be a steal!